Mr David Ross is a senior Consultant in Plastic Surgery at Guys and and St Thomas' and Honorary Consultant at St Marks and Kings College Hospitals. He qualified from UCL. During his specialist training David completed his thesis in Melanoma and cancer genetics, as well as a postgraduate diploma in the history of medicine. He completed his specialist training in cancer reconstruction at the MD Anderson In Texas, and the Royal Marsden. He has an international reputation in several areas of reconstructive and aesthetic surgery and sees patients from across the globe. 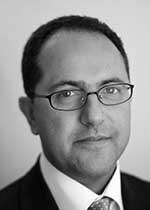 David is committed to education and conceived and directs Fellowships in both Microsurgery and Aesthetic surgery. He lectures regularly in the UK and abroad and has authored many publications and book chapters. Mr David Ross does not hold a share or financial interest in this hospital, another Nuffield Health hospital or the company. Mr David Ross does not have a share or financial interest in equipment used at this hospital or another Nuffield Health hospital. Mr David Ross does not hold any paid advisory role(s) at this hospital or on behalf of Nuffield Health.